Last Tuesday when I went to the farmers’ market, I bought lavraki (sea bass) as I wanted to make a recipe I had bookmarked some days ago from Nancy Gaifallia’s blog in About.com. (Unfortunately she is no longer writing there). When I read the ingredients and the way of preparation, I knew this would be a great hit for my family and I was not wrong. Nancy’s recipe is perfect just as it is but you know me by now that I can’t stick to a recipe and made just a couple of changes. That day I had bought some fresh mint from the farmers market and added just a few leaves, to test if it would match with the other flavours and it turned out to add a lovely extra flavour, if you like mint. I did not add oregano, not that I do not like it but merely because I forgot to add it 😛 and the third change was to add all the liquid ingredients on the fish. Nancy mentions 5 cloves of garlic. I added two which sometimes could be equivalent or more as we get some huge garlic cloves, here in Greece. The fish turned out perfect with wonderful flavours and lots of juices from the tomato, oil, lemon and wine which formed a lovely dressing for the fish. This I will definitely make again and it will also be great with other types of big fish as well. Certainly this makes a great presentation when you have company and can be prepared in advance and once it’s in the oven, you don’t have to be in the kitchen all the time. I am submitting this recipe to Ruth, of Ruth’s kitchen experiments, for her event Bookmarked Recipes. Adapted from Nancy Gaifallia’s recipe. Ask your fish monger to gut and scale the fish (leaving heads on), and rinse well. Pat dry. Lightly salt inside and out. Combine parsley, finely chopped mint, garlic, and a little more salt and stuff the stomach cavities. 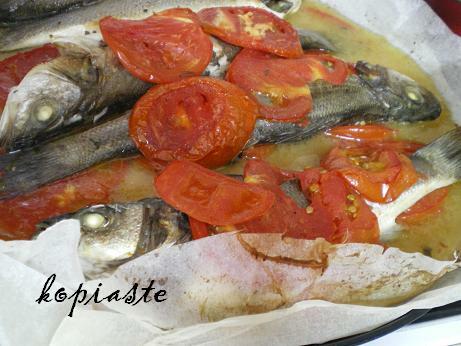 Add slices of tomato on top of fish and pour wine, lemon juice and olive oil on top. Season again with salt and pepper. Bake for about 45 minutes. To test for doneness, press the paper with your hand. The fish should be soft. I served this dish with Healthy, lemony potatoes wrapped in parchment paper (Patates sti Ladokolla). When the potatoes were done, I left them wrapped in the parchment paper and cooked the fish for 45 minutes. Some times, it seems like you read my mind. This style of fish has been in the back of my head for like a week or two now, and now I see it here, and I want it, lol! It looks really good and sounds like a great way to enjoy fresh fish. Ivy, I love your new place! I too am thinking of moving to WordPress. Will email you soon. Mike, great minds think alike 😛 It seems that we both like fish. Cynthia, I am glad to see you here as well. I will be waiting for your e-mail and shall be glad to help, if I can. The only disadvantage of WordPress is that I don’t see your lovely photos in the comments any more. Sis, having company always means a lot of time in the kitchen, so this allows more time to chat. I am a heathen, having never heard of Nancy before, but I love discovering new chefs. Your sea bass looks wonderful Ivy – I am coming over for dinner. My mom just made a similar parchment baked fish and has been raving about it for 2 weeks. Now you present your lovely dish. I think this is a sign to make mine own! Ivy, this fish looks so tasty and delicious. Perfectly cooked! Thanks for sending it to bookmarked recipes! Would you believe I’ve never tried seabass before (nor did I hear about Nancy)? Everything tastes so much better in parchment paper and I do loke your variations on the recipe! Hi Lore and thanks. I don’t know what the problem was yesterday but it seems to be solved. Love fishing and eating fish. We do not have this fish but I am sure I can use your recipe with another kind. keep it up and look forward to more recipes with fish. To be honest, I’m missing fresh fishes. These seabass looks so yummy. Can’t wait to cook this in my kitchen. it’s an amazing recipe which i will be try thanks for posting..
Oh! Seabass is awesome. I love fish very much. I love trot, salmon. Anyway I’ll try your recipe. Thanks for sharing.